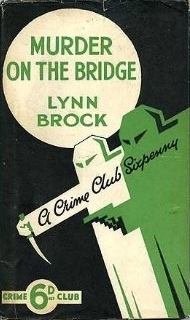 Murder on the Bridge, published in 1930 (and also known as QED), is one of Lynn Brock’s Colonel Gore mysteries. It’s a bit of a hybrid but it’s not entirely lacking in interest. I confess to knowing virtually nothing about Lynn Brock other than the fact that his real name was Alister McAllister, he was an Irishman and he served as an intelligence officer for the British in the First World War. Murder on the Bridge opens with a fairly impressive murder on a suspension bridge in heavy fog. The bridge is a toll bridge and the toll collectors should have been aware of every car and pedestrian on the bridge at the time of the murder (traffic being rather light at night when the killing took place). Unfortunately due to the fog most of the potential eyewitnesses can give little useful information. Dr Melhuish was a successful general practitioner in the major town of the fictional county of Westshire in the west of England. The murder seemed to be rather elaborately planned. No-one is able to suggest why anyone would want to go to so much trouble to kill a rather obscure country doctor. There is one clue - an unfinished letter the deceased had been writing to Colonel Gore. Colonel Gore is godfather to Dr Melhuish’s young son Simon although he seems to have been better acquainted with Mrs Melhuish than with her husband. Dr and Mrs Melhuish had been involved in a celebrated murder case a few years earlier in which Colonel Gore had gathered sufficient evidence against a notorious murderess to see her brought to trial but alas not enough evidence to get her convicted. This had unfortunately somewhat soured the Colonel’s hitherto friendly working relationship with Inspector Lord. Inspector Lord is now understandably reluctant to accept Colonel Gore’s speculations about this new murder case. The plot will involve money-lending, disguises, American gangsters, South African diamonds, a Pekingese named Duggie and a wire-haired terrier. The Pekingese and the terrier will prove to be crucial witnesses. Colonel Gore himself is an ex-army man who discovered that a fine wartime record provided him with few qualifications for peacetime employment. He has however managed to do quite well for himself as a private detective - he is now the principal of a rather successful detective agency, an agency that is prosperous enough to refuse the more sordid cases that such agencies are usually forced to undertake such as divorce work. Colonel Gore is a typically English sort of private detective. He does not carry firearms and he is a long way from being a two-fisted hero. He does however manage to get himself beaten up rather badly on several occasions during the course of his investigation, this being one of the features of the book that make it a slightly unusual example of the English detective story of this era. This is as I said earlier a kind of hybrid. The toner is mostly that of the classic golden age detective story and Colonel Gore is very much a typical detective hero of that school. The plot though, while it does include some real detection as Gore follows up various clues (such as a mysterious badge bearing the QED logo), is more of an amalgam of the police procedural, the Edgar Wallace-style thriller and the American hardboiled school. The major fault of the plot is an excessive reliance on coincidence. The colourful characters, the rather high body count and the odd juxtaposition of American gangsters and a quintessentially English setting do however offer enough compensations to overcome this fault. It’s also amusing to see the American gangsters discovering that working the rackets in England is a lot more difficult than being a racketeer in New York. Murder on the Bridge is an entertaining little book. Recommended. 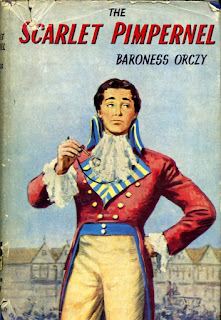 Baroness Orczy’s The Scarlet Pimpernel was published in 1905 and was, as the saying goers, a publishing phenomenon. So successful was it that she produced no less than thirteen sequels. With this novel she also created a new type of hero, a hero who would have countless successors. Baroness Emma Magdolna Rozália Mária Jozefa Borbála Orczy de Orci, usually known as Emmuska, was born in Hungary in 1865. Her family were forced to leave Hungary and eventually settled in London where the fifteen-year-old Emmuska began to learn English, the language in which her vast output of novels and stories would be written. Initially her literary endeavours met with mixed success. The Scarlet Pimpernel, her second novel, was rejected by a dozen publishers. She turned it into a play which became a hit after which the novel finally found a publisher and promptly became a bestseller. As well as the many Pimpernel sequels she wrote many other works of historical and spy fiction as well as a considerable number of detective stories (of which the Old Man in the Corner series is very highly regarded). Baroness Orczy was an aristocratic by both birth and inclination so that when she decided to try her hand at historical adventure fiction it’s perhaps not surprising that the grim fate of the French aristocracy after the Revolution should have attracted her attention. Her hero, an English aristocrat, would be a man with a dual identity. To outward appearances Sir Percy Blakeney is one of the biggest fools in England, an effete dandy who would be even more widely despised if he were not so rich. In reality Blakeney is a bold, brave, daring and very intelligent man who works as a kind of freelance secret agent. With a group of other young English noblemen he rescues French aristocrats from the shadow of the guillotine at the height of the Terror in the early 1790s. The hero with a secret identity would go on to become one of the most ubiquitous devices in popular fiction. Zorro, Batman, the Green Hornet - these heroes were all based directed on Orczy’s model. The Scarlet Pimpernel is as much a romance as a tale of adventure. Sir Percy Blakeney has a wife named Marguerite, a Frenchwoman. Lady Blakeney is, ironically suspected of betraying French aristocrats into the hands of the dreaded Committee of Public Safety and thus leading them to the guillotine. This has soured her marriage although she has no idea that her inane good-natured husband is really the Scarlet Pimpernel. Of course things are not so simple as they appear to be. The resolution of their romantic difficulties occupies a good deal of the author’s time. It has to be admitted that these two strands of the story, the romantic and the adventurous, are woven together with great dexterity. In this first adventure the Scarlet Pimpernel must not only rescue aristocrats from the guillotine, he must also keep himself out of the clutches of the dangerous and determined representative of the Committee of Public Safety, Chauvelin. While he is thus occupied Marguerite must find a way to save her husband from the consequences of her own indiscretions. A modern reader may find that there’s not as much action as might be expected. In fact there’s rather less action than can be found in other contemporary swashbucklers such as Anthony Hope’s 1894 The Prisoner of Zenda. While Orczy might be a little weak on action scenes she’s undeniably skillful when it comes to building suspense, and she’s very skillful indeed in putting her hero in situations from which we feel he cannot possibly escape (but of course he does). The Scarlet Pimpernel relies on his wits rather than on swordsmanship or fisticuffs. In that respect he is of course a quite plausible hero; real-life spies are likely to find that cunning is rather more useful than fighting skills. Sir Percy Blakeney is one of the great popular fiction heroes. He was the template for later similar heroes but none surpassed him for sheer heroic bravado or for the skill with which he wore the mask of the fool. In Chauvelin he has a worthy adversary - an implacable fanatic of great intelligence and extraordinary deviousness and one of the great literary villains. Sir Percy Blakeney’s own political views are never explicitly mentioned - his passionate opposition to the French Revolutionaries is moral rather than political. For all their high talk of liberty, equality and brotherhood they have only succeeded in creating a bloodbath and a police state. Both the author and her hero also have a shrewd understanding of the way that Revolutions inevitably devour their own. It is made quite clear that those who live in greatest fear are the Revolutionaries themselves - at any moment they may be denounced for a lack of revolutionary zeal and find themselves facing the guillotine themselves. Terror breeds more terror and no-one is safe. This story is pure melodrama but there’s nothing wrong with melodrama when it’s well executed, as it is here. The mix of suspense, romance and humour is consistently engaging. The Scarlet Pimpernel has a great deal of historical importance as having inspired so much of the adventure fiction of the 20th century and for that reason alone it is essential reading for fans of the genre. It’s also a highly entertaining tale in its own right. Recommended. 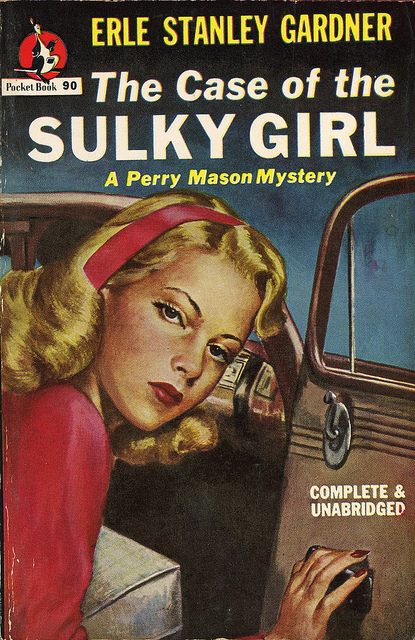 The Case of the Sulky Girl, published in 1933, was the second of Erle Stanley Gardner’s Perry Mason mysteries. Gardner was by no means a novice author - he’d been a prolific writer of pulp fiction for some years and was in fact one of the most popular contributors to Black Mask. The Case of the Sulky Girl follows the standard formula that would make Gardner one of the most successful mystery writers in history. As anyone familiar with Gardner’s work can attest the adherence to formula was no bad thing - it was a formula that worked and Gardner’s mastery of plotting ensured that the reader would still find it a formidable challenge to match wits with Perry Mason. A young woman seeks Perry’s advice in relation to a will. It’s not the sort of matter an eminent trial lawyer would normally concern himself with but the client’s manner intrigues him. She seems sulky - or is she actually in a panic and trying to cover it up? Frances Celane is potentially a very rich young lady. Potentially, because the terms of that will mean that she could stand to inherit the very modest sum of $5,000 - or she could come into a fortune of more than a million dollars (fabulous wealth indeed in 1933). It all depends on her uncle who is also the trustee of her father’s estate. The will allows him an extraordinary degree of discretion. There is also a suggestion that Miss Celane is being blackmailed. To call Frances Celane high-spirited would be an understatement of epic proportions. As Perry remarks to his faithful secretary Della Street, if Frances is not a hell-cat she’s certainly a hell-kitten. As is usual in a Perry Mason mystery the famous trial lawyer gets involved in the case before a murder actually occurs. And a murder does most certainly occur. There’s one suspect with a very obvious motive, but that suspect has an alibi. There’s also an eyewitness to the murder. At least the eyewitness saw something, but what exactly did he see? Gardner had a passionate belief in upholding the rights of accused persons and an equally passionate conviction that police officers and district attorneys rarely had much respect for those rights. His fictional alter ego shares those beliefs. The problem as Mason sees it is not corrupt cops or DAs (although some undoubtedly are corrupt). The real problem is ambitious opportunistic DAs who will quite cheerfully railroad a suspect all the way to the gas chamber to advance their careers, and over-zealous policemen who will pressure suspects into making statements and answering questions that in fact they are under no obligation to answer. In such circumstances (in Perry Mason’s view) a defence attorney need feel no moral qualms about cutting a few corners himself. In fact, particularly in the early Mason mysteries, the wily lawyer at times goes perilously close to breaking the law himself. Having been a very successful trial lawyer himself Gardner not only understood the ins and outs of legal procedure he also had a profound understanding of the psychology of juries. Knowing the law is helpful but it’s not enough. A good lawyer has to be a consummate actor, a skilled strategist and a psychologist. Perry Mason is all of these things. Gardner could write courtroom scenes that are tense and exciting but what makes them particularly enthralling is that no matter how extravagant Mason’s style might be these scenes are legally soundly based. Mason’s legal tricks work because they’re the very legal tricks Gardner himself was notorious for using. The courtoom scenes in The Case of the Sulky Girl are especially good as Mason lays elaborate traps for the unscrupulous but hapless DA. Gardner has been criticised for the weakness of his characterisations, a criticism that is both tiresome and entirely irrelevant. Gardner wrote plot-centred mysteries and his plotting was masterful. In this particular case though Frances Celane does come across as an entertaining if perhaps not very deep character. Her uncanny ability to do just exactly what Perry Mason doesn’t want her to do and to dig herself an ever deeper hole provides quite a bit of fun. It’s also odd that critics who get very excited about social comment in detective fiction haven’t noticed that there’s a great deal of such social comment in the Perry Mason stories, particularly in regards to troublesome and complex issues like the balance between law and order on the one hand and individual freedom on the other. The Case of the Sulky Girl is classic Gardner - ingeniously plotted, fast-paced and with a wonderful bravura courtroom climax. Highly recommended. 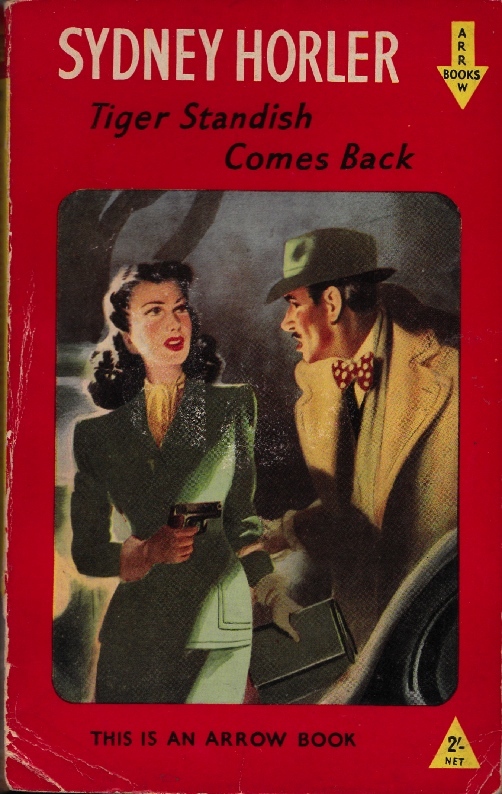 Tiger Standish Comes Back was the second of Sydney Horler’s Tiger Standish thrillers. It appeared in 1934. Today Horler is perhaps the most widely reviled of all British thriller writers of that era, for reasons that have little to do with his abilities as a writer. In Tiger Standish, published in 1932, the eponymous hero had foiled the plans of an international criminal gang. Now the leader of the gang, the sinister Rahusen, wants his revenge. Rahusen wants Standish dead but he wants him to suffer first, so his first targets will be Standish’s wife and his father. The plot follows the familiar template established by H. C. McNeile (“Sapper”) in his Bulldog Drummond thrillers, with kidnapping and various narrow escapes being crucial ingredients. It’s not just a simple revenge story however - Rahusen is mixed up in another vast conspiracy which could bring the British government to its knees and threaten world peace. Standish had been an agent with the ultra-secret British intelligence unit Q1 and Q1 will become involved in this new adventure. This is not entirely to Tiger’s liking - he prefers to operate as a lone wolf. The expected plot twists are all there along with plenty of action. There are knife-wielding assassins, the criminal gang has a cunningly concealed secret headquarters, the villains are ruthless and vicious, the hero adopts disguises, there are car chases - all the usual ingredients. Standish was clearly modeled on Bulldog Drummond. Both are very much upper-class heroes although Standish is even more upper-class than Hugh Drummond, being the son of an earl. Naturally such a hero is a fine sportsman, although oddly enough Tiger’s sporting prowess lies not in games like cricket or rugger but in football (or soccer as those outside of England call it). And while you might expect a rugged masculine hero like Tiger to have a faithful dog what he in fact has is a faithful cat. Possibly Horler thought this would be an interesting twist, or perhaps he was simply a cat-lover himself. Mind you Richard the Lion is, as cats go, somewhat heroic. Sydney Horler (1888-1954) wrote 157 novels, including mysteries, thrillers, adventure tales and football stories (a rather popular sub-genre in Britain at that time). His books sold in the millions. Unfortunately for his lasting reputation Horler held the sorts of views that are nowadays regarded as being totally unacceptable - he believed in King and Country and in the Church of England and he disapproved of sexual immorality. The fact that his hero was a member of the aristocracy merely compounded the sin. Sadly most modern critics simply cannot get past these things and assume that if they disagree with a writer’s political views then that writer must necessarily be a bad writer. Horler was even more conservative than H. C. McNeile so even those who grudgingly admit that the Bulldog Drummond stories have a certain zest tend to simply condemn Horler out of hand. Despite what the somewhat hysterical condemnations of critics like Colin Watson might lead you to believe, unless you’re really consciously looking for something to be offended by you’ll find Tiger Standish Comes Back to be relatively innocuous. To be honest Horler is not in the premier division of British interwar thriller writers - he can’t quite match the gusto of the Bulldog Drummond novels and he doesn’t quite have the style and panache of Leslie Charteris’s Saint stories or the sheer manic exuberance of Berkeley Gray’s Norman Conquest books. Horler was however a perfectly competent second division thriller writer and the Tiger Standish novels are thoroughly entertaining. There’s not a lot of literary polish on display but there’s a rough-hewn blustering vitality that is quite appealing. Tiger Standish Comes Back is not exactly subtle but it’s enjoyably trashy fun. Recommended. 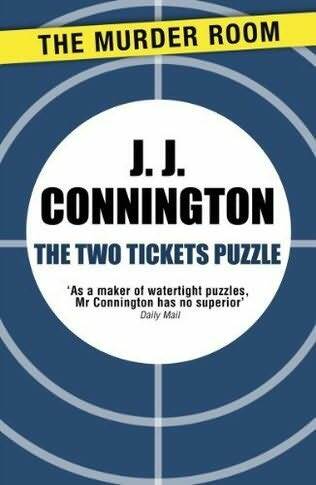 The Two Tickets Puzzle (sometimes known as The Two Ticket Puzzle) is a 1930 detective novel by J. J. Connington. 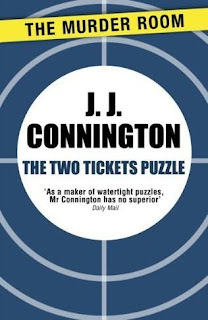 Connington is best known to fans of the genre for his Sir Clinton Driffield mysteries (such as the excellent Murder in the Maze) but The Two Tickets Puzzle is one of his two mysteries featuring Superintendent Ross. A body is found in a first class compartment of the 10.35 local train from Horston to Hammersleigh. The man had been shot several times. It’s clearly murder but the bullet wounds are very puzzling. Two different calibre bullets were involved but several of the shots to the man’s head did very little damage. Superintendent Ross and his very thorough assistant Inspector Mornington manage to identify all of the passengers in the first class carriage and the third class carriage behind it. The murder could only have been committed by someone in one of those two carriages. There are plenty of clues and a couple of obvious suspects but Superintendent Ross is not satisfied by the evidence. And he has to explain how Farmer Chepstow’s prize ram was shot a week earlier - that luckless sheep may hold the solution to the mystery. This is very much in the police procedural mould. It’s also quite similar in both style and structure to the Inspector French mysteries of Freeman Wills Crofts. Superintendent Ross’s approach to crime-solving would please Inspector French - Ross also has a passion for patient methodical investigations. He is the sort of policeman who will not even contemplate making an arrest until he is entirely satisfied that every single element in the case has been accounted for. Those who dislike golden age puzzle-plot mysteries will groan at the sight of maps and railway timetables but devotees of this school will be as delighted by these things as Superintendent Ross. Connington demonstrates his ability to construct an intricate plot that almost equals Crofts at his best. Superintendent Ross is not exactly a colourful detective. In fact he’s a lot less colourful than Connington’s usual series detective Sir Clinton Driffield. 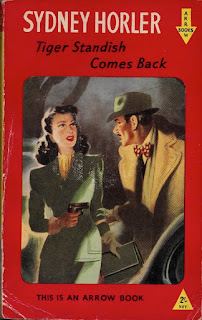 I suspect this is why the book was not written as a Sir Clinton Driffield novel - this is such a purely plot-driven tale that Connington needed a detective who would not distract the reader with his own idiosyncrasies. While the emphasis is on the unraveling of the complex plot the novel ends with a surprising amount of action - in fact it reaches its climax with a car chase and a shoot-out! Everything a fan of golden age mysteries could desire can be found here - unbreakable alibis, the vital importance of piecing together the correct sequence of events, the importance of placing the murderer at a precise location at a precise time, an abundance of clues, puzzling forensic evidence, a focus on the tiniest details which initially seem unimportant, tangled motives, even a crucial will. Connington plays pretty fair with his reader - if the reader chooses to leap to conclusions or to misinterpret vital clues that’s all part of the game. The correct clues are there in plain sight. This is in fact a textbook example of the fair-play golden age puzzle-plot mystery and it’s a joy to watch a master of the genre go through his paces. 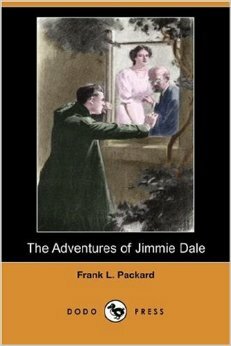 Frank L. Packard (1877-1942) was a Canadian who wrote crime and adventure fiction but gained his greatest fame with his Jimmie Dale stories. Jimmie Dale, alias the Grey Seal, is a very very early example of both the masked avenger type of hero and the hero with a secret identity. Raffles, created by E. W. Hornung, had proved that the public loved the idea of a gentleman-thief but there was still a slight problem - even a gentleman-thief is, in the final analysis, a criminal and therefore not quite a true hero. It would be obviously very advantageous to have a protagonist who combined the gentleman-thief and the hero in a single character. This could be done easily enough by making him a Robin Hood figure - a man who commits daring robberies but also helps people and fights injustice. American Louis Joseph Vance, with the Lone Wolf, came up with this solution in 1914. Packard followed him into print with his own hero Jimmie Dale in his 1917 The Adventures of Jimmie Dale. It should be pointed out in passing that Raffles had not been, technically, a gentleman. He merely passed as one. Jimmie Dale is however the genuine article. So why would a gentleman become a celebrated thief? The answer is that Jimmie’s fortune came from his father’s safe-manufacturing business. Jimmie had decided to amuse himself by finding out just how difficult it would be to crack safes. Cracking safes turned out to be great fun but as a result of a mischance Jimmie finds himself having no choice in the matter. He must continue his career as a cracksman whether he wants to or not. He is no ordinary safe-cracker however - he steals only in order to right wrongs. The first half of the book takes the form of a collection of linked short stories, or an episodic novel, the link being provided by Jimmie’s attempts to establish the identity of the person who pulls the strings to which he must dance. The second half is more of a connected narrative as Jimmie faces his biggest challenge playing for the highest stakes possible. This second half also moves the book more overtly into thriller territory complete with a gigantic diabolical criminal conspiracy worthy of Professor Moriarty. Jimmie is a hero with three identities - Jimmie Dale the handsome rich young man-about-town, the Grey Seal the glamorous philanthropic burglar, and the seedy low-life denizen of the underworld Larry the Bat. A hero of this type has to have a trademark. In this case he leaves behind a grey diamond-shaped paper seal at the scene of each crime, hence his nickname. The adventures chronicled in the book all obviously follow a fairly similar formula - Jimmie has to carry out a hazardous burglary which will in some way serve the ends of justice, he will have a narrow escape from capture and will often face even greater perils from disgruntled criminals. Packard adds just enough variety to keep things interesting. On occasion Jimmie even has to deal with crooked policemen. The stories are set in London but perhaps not surprisingly (given that Packard was Canadian) some of the underworld haunts described sound like they would not have been out of place in the wilds of the Yukon! Mind you, the London underworld in Victorian and Edwardian times could in reality be a pretty tough place. These adventures have a slightly tougher and definitely seedier edge to them than the original Raffles stories. Jimmie Dale’s adventures take him into some rather sordid places including opium dens and some very squalid hovels. One thing that perhaps gives away the fact that the author was a Canadian is that his burglars and petty thieves show a remarkable willingness to both carry and use guns. It has always been my impression that the professional criminal classes in England at that time were extremely reluctant even to carry a gun - carrying a gun meant the risk that a burglary would end in murder and murder meant the hangman’s rope. This is an element that seems more typical of later American hardboiled crime fiction rather than Edwardian British detective fiction. There’s also a love story here but a rather unconventional one since Jimmie has never set eyes on the object of his devotion. In true medieval knight-errant style he is in love with an ideal of womanhood but whether this love can ever be transformed into a solid reality depends on Jimmie’s courage and daring, and of course on his decency and honour. The Adventures of Jimmie Dale intriguingly combines a very Edwardian tone with hints of the grittiness of the not-yet-emerged American hardboiled school. The hero is conventionally brave and noble and the villains certainly owe a good deal to the melodrama tradition. It’s fine adventure fiction and provides plenty of breathless excitement as the hero struggles to stay one step ahead of both the police and the villains. Very enjoyable and warmly recommended.